The installation of permanent lighting fixtures to a landscaped area adds visual interest, drama and makes an outdoor space more functional after the sun goes down. E.L.S. 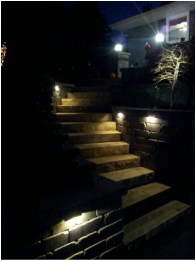 Landscaping can incorporate lighting into any landscape design. Options include installation of fixtures to illuminate trees or plants in beds and fixtures which are mounted to retaining walls or pillars to provide either ambient lighting or illumination along a walkway. Patios which include steps between levels will benefit from lighting for safety reasons, to ensure the change in elevation will be visible.E.L.S. ​Landscaping uses top quality commercial grade fixtures and transformers from manufacturers such as Kitchler, RSI and FX, which will withstand the winter conditions in Wisconsin year after year. ​The addition of permanently installed speakers to bring music into the outdoors is a trend in landscape design. Speakers can be installed unobtrusively amongst plantings in strategic locations to add soundscaping to the visual tranquility of well-landscaped yard.